František Jánoška sa narodil v roku 1986 v Bratislave. Vo veku piatich rokov začal hrať na klavíri, študoval na Štátnom konzervatóriu v Bratislave a neskôr pokračoval v štúdiu na Vysokej škole múzických umení vo Viedni. František Jánośka je tiež aktívny ako skladateľ, ktorý píše ako klasickú, tak jazzovúj kompozíciu, taktiež je aranžérom. 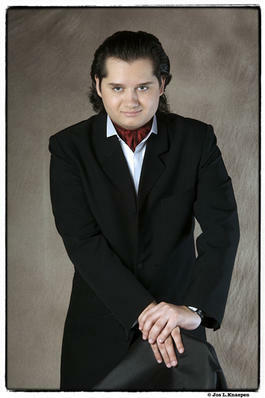 He has won several 1st prizes in competitions including the Dezider Kardos piano competition in Slovakia 1994 (he was considered to be the youngest and most talented competitor ever), the European competition of young talents in Revuca (Slovakia) 1998 (here he performed his own composition), the International Liszt Ferenc competition in Hungary 2002, Banska Bystrica 2004 (among the most distinguished pianists from Slovakia). In 2006 he was admitted to the ﬁnal round of the international competition Martial Solal in Paris. Frantisek Janoska fascinates his audiences through his performances of Jazz. He is – like his brother Roman – a member of the jazz quartet No Limit, which won a jazz competition in Straubing, Germany. This afforded him the opportunity to record a CD and participate in the international jazz festival “Jazz an der Donau” in Germany. Here he had the privilege of meeting famous musicians such as BB King, Roy Hargrove, George Benson, and others. Janoska and his quartet appeared at the festival in Getxo (Spain), alongside artists such as John Scoﬁeld and his trio. In 2006 Frantisek Janoska became a member of the Roby Lakatos ensemble, which tours worldwide to places like the USA (Carnegie Hall), Japan, Canada, United Kingdom, Austria (Vienna Musikverein), Sweden, Italy, Turkey, Holland, Belgium, China, United Arabian Emirates, Scotland, Germany and many other countries. During these tours he has been featured with numerous great artists such as Bireli Lagrene and Michel Camilo. Since 2008 Frantisek Janoska plays with “The Philharmonics”, the ensemble of the Viennese Philharmonics violinist Tibor Kovác.